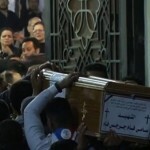 Funerals have begun in Egypt for victims of two bomb attacks targeting Coptic Christian churches on Sunday. At least 49 people were killed, and over 100 people were injured. ISIS has claimed responsibility for the attacks, which targeted the St. George’s Coptic church in the northern city of Tanta and the St. Mark’s Cathedral in Alexandria. Funerals have begun in Egypt for victims of two bomb attacks targeting Coptic Christian churches on Sunday. At least 49 people were killed, and over 100 people were injured. ISIS has claimed responsibility for the attacks, which targeted the St. George’s Coptic church in the northern city of Tanta and the St. Mark’s Cathedral in Alexandria. Egyptian President Abdel Fattah el-Sisi responded by declaring a three-month state of emergency. The state of emergency gives el-Sisi’s government even further power to continue its crackdown against human rights activists and journalists. Attorney General Jeff Sessions is attempting to shake up policing in the country by limiting federal oversight of police departments with a history of civil rights violations, while calling for an escalation of the war on drugs. Last week, Sessions ordered a wide-ranging review of the federal consent decrees with local law enforcement agencies that have been accused of brutality and violating civil rights laws. The review signals the Justice Department intends to shift away from monitoring and forcing changes within police departments, such as the police department of Ferguson, Missouri, where systematic racial discrimination by the police and the police killing of unarmed 18-year-old African American Michael Brown sparked an uprising in 2014. This comes as Sessions is also calling for what many see as a new war on drugs. Attorney General Jeff Sessions is attempting to shake up policing in the country by limiting federal oversight of police departments with a history of civil rights violations, while calling for an escalation of the war on drugs. Last week, Sessions ordered a wide-ranging review of the federal consent decrees with local law enforcement agencies that have been accused of brutality and violating civil rights laws. The review signals the Justice Department intends to shift away from monitoring and forcing changes within police departments, such as the police department of Ferguson, Missouri, where systematic racial discrimination by the police and the police killing of unarmed 18-year-old African American Michael Brown sparked an uprising in 2014. Attorney General Jeff Sessions also called for what many see as a new war on drugs during a speech in Richmond, Virginia. Head of the NAACP LDF on United Airlines Video: Violence Is Becoming Part of Everyday Life in U.S.
United Airlines is facing widespread criticism after video surfaced of a doctor being forcibly dragged off a plane by security officers on Sunday, after United overbooked the flight and then demanded some passengers disembark. The flight was leaving from Chicago O’Hare International Airport and was headed to Louisville, Kentucky. When no one volunteered to get off the flight, the 69-year-old man was selected to be forced off the plane. He protested, saying he was a doctor who needed to see patients at a hospital in Kentucky the following morning. The Washington Post reports a fellow passenger says:,”He said, more or less, ’I’m being selected because I’m Chinese.’” Multiple Chicago Department of Aviation security officers then began dragging him through the aisle as fellow passengers screamed. After being removed, the man, who was bloodied by the first removal, attempted to run back onto the plane. He was then forcibly removed a second time. Does President Trump stand to personally profit off the wars he is escalating in Iraq, Yemen, Syria, Somalia and beyond? That’s the question many are asking, after it emerged that Trump has personally invested in Raytheon, the military contractor who makes the Tomahawk missiles used in the U.S. strike on a Syrian airbase last week. Raytheon’s stocks briefly surged after the attack. Overall, the stocks of defense contractors, such as Boeing and General Dynamics, have increased since Trump’s election, further fueled by his promise of a “historic” 10 percent increase in U.S. military spending. You may pre-order all 12 signs of the 2017 Spring Reading this week for just $39.39. What we’re living through today is not written about in any book. We’re its pioneers in consciousness, and INVOLUTION will be your guide.